On November 3rd, 2016 the hiring notice for the NAC’s first Artistic Director of Indigenous Theatre was issued by Human Resources. The Advisory Committee comprised of Reneltta Arluk, Dave Jennis, Annie Smith St. Georges, Jesse Wabegijig, and Kenneth T. Williams along with Brittany Ryan and Sarah Garton Stanley have been working together over the last several months towards this first big goal. On October 24, 2016 the committee gathered together in Ottawa with Debbie Collins, Director of Human Resources to help finalize the hiring notice and related questions such as helping determine members of the Vetting Committee and the structure for the Elders Council. A full day in-person meeting was invaluable for transforming the goals of the committee from a body primarily assembled to make recommendations on hiring to a group more focused on developing support mechanism for the large communities of Indigenous artists, leaders, movers and shakers as well as the NAC staff, through the as applications and questions are sent in. 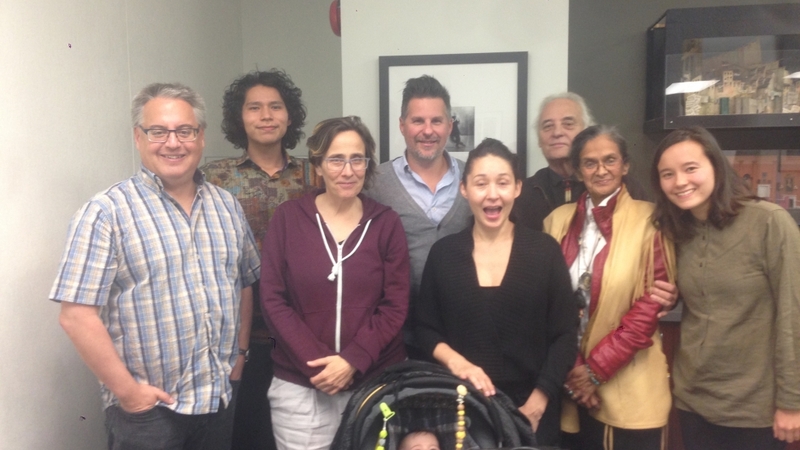 Also on October 24th Sarah Garton Stanley and Kari Cullen met with Chief Kirby Whiteduck from Pikwàkanagàn and Chief Jean-Guy Whiteduck, along with Elder Annie Smith St. Georges from Kitigan Zibi Anishinabeg and Natali Zuniga, Cultural Heritage, City of Ottawa. Peter Herrndorf (CEO and President) was there to welcome the chiefs at the beginning of the meeting and was also able to come by to spend time with the Advisory later that afternoon. The purpose of the meeting was for the NAC to begin to learn how the NAC and the Algonquin Anishnabe Nation can collaborate moving into the future. When the Artistic Director of Indigenous Theatre and their team begin their term, they will develop their own relationships with Indigenous artists, leaders, and communities in conjunction with the NAC. However, the NAC as an institution continues to be committed to building relationships with Indigenous leaders from the territory and beyond, before the Indigenous Theatre section officially begins. The NAC has built and continues to build relationships that are understood as the responsibility of the institution and all its sections, not just an expectation of Indigenous Theatre. Sarah Garton Stanley attended the Truth and Reconciliation Summit organized by the Banff Centre on October 29-30. She was invited as a “Thought Leader” and also participated on a live-streamed panel in which participants discussed their work as it pertains to the Truth and Reconciliation Commission of Canada’s 94 calls to action and how to inspire those gathered to take action. The Banff Centre was where The Cycle begun in collaboration with IPAA in April 2013. In an ongoing action the NAC is dedicated to is bringing Indigenous educators, presenters, artists, and facilitators to work with NAC employees across the organization: from security to programming, and from food & beverage to music education. On October 25th Kevin Lamoureux, Associate Vice President of Indigenous Affairs at the University of Winnipeg led about 25 NAC employees through an educational session called Indigenous Insights. The session gave ample room for exchange and question among the participants. Next up is an artist talk with Tanya Tagaq on November 28. Last up for this busy month: Following the pattern we shared with you in previous updates, the Hiring Process is now underway! Based on feedback from the Advisory Committee and the NAC we will be expanding the Vetting Committee to a group of 9 and the Selection Committee to a group of 5. This expansion allows for a broader representation of people and experiences throughout the process. As always if you have any questions or comments please contact us at brittany.ryan@nac-cna.ca.